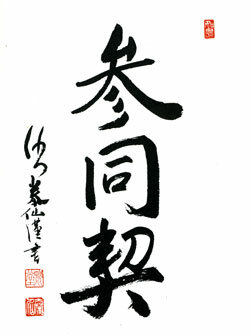 The title, Sandōkai, refers to the unity, harmony, or meeting of sameness and difference, the relative and the absolute. San-Dō-Kai. “San” means plurality, diversity and difference. “Dō” means sameness, equality, oneness, or commonality. “Kai” means “to shake hands” or agreement. “San” is associated with the Japanese principle of “ji” or relative reality, “dō” with the Japanese principle of “ri,” or absolute reality. The poem shares its name with an earlier Taoist text, underscoring the historical influence of Taoism on emerging Chinese Buddhism. The poem is essentially about the unity of ri and ji, or non-dual and everyday reality. Non-duality is an important concept in Zen, but it’s a relative latecomer on the Buddhist scene. The Pali Canon, the earliest strata of Buddhist sutras, makes no reference to it, and it only finds its full flowering in Nagarjuna’s 2nd century writings on emptiness and Asanga and Vasubandhu’s 4th century writings on subject-object non-dualism. Non-duality is also a crucial concept within Advaita Vedanta, a non-Buddhist philosophical school which developed alongside the Mahayana in India. Not only do conceptual boundaries not inhere to reality independently of ourselves, but everything that exists shares an interdependent existence with everything else that exists. Things do not exist in isolation. They only exist in interrelationship with each other. We can’t exist without oxygen, water, sunlight, plants, animals, gravity and a surface to move upon. We can’t come into this world without others who give birth to and care for us. The sun can’t exist independent of the laws of physics. The words and meaning of what you are reading right now depend on semantic and syntactic relationships, a corpus of knowledge, and the invention of writing, computers, the electrical grid, and the internet — all socially constructed and dependent on innumerable others, past and present. “Tall” means nothing unless something is also “short.” “Inside” means nothing without an “outside.” “Here” means nothing without a “there.” “Good” and “bad” depend on each other for existence, and on humans whose needs and predilections define them. A world without humans is neither “good” nor “bad.” Without humans, earthquakes and viruses are just natural phenomena, neither good, nor bad. No ethics are violated when a lion kills an antelope. When humans kill, ethics appear. This is a conceptual understanding of non-duality, but Buddhism points to an understanding beyond the conceptual, and this is where Zen makes an extraordinary claim — that it’s possible to directly apprehend non-duality, not as a concept but as reality itself — that it’s possible through zazen or koan study or happenstance to have moments when the conceptual map drops away and we’re left seeing the world and ourselves in an unmediated, startlingly new way. The Japanese call these moments kensho or satori, and the metaphor often used to describe them is that of the bottom falling out of a bucket. Many people have told me they’ve had such experiences. I’ve been sitting zazen for nineteen years, however, and while I’ve had many remarkable experiences, I can’t tell you I’ve had this kind of direct apprehension of non-duality. I can’t even imagine what the phrase “direct unmediated experience of non-dual reality” actually means. I think I may be an unusually dull Zen student. The Sandōkai includes a line about human faculties being either “sharp or dull.” Commenting on the line, Suzuki Roshi says “a dull person is good because he is dull; a sharp person is good because he is sharp. Even though you compare, you cannot say which is best. I am not so sharp, so I understand this very well.” So I sit zazen without bothering myself about such things. When sitting, just sit. Maybe one day lightning will strike. Until then, I can only tell you what others say. The Sandōkai asks us to view the world with bifocals, to live life at the crosshairs of the relative and the absolute, to understand that “relative” and “absolute” are the same, like ice and water. Suzuki Roshi said that explaining this through words is like scratching an itchy foot through one’s shoes. Language is inherently dualistic, and explaining non-duality through language is, as Allan Watts put it, a matter of “effing the ineffable.” But what choice do we have? We either remain silent, or we point beyond words through words. How does this bi-focality, this double vision, affect our everyday lives? How does an intimation of non-duality affect the way we live, moment by moment? Fifty years ago I had a profound religious experience on LSD, but I couldn’t relate that experience to my daily life. What did it have to do with the price of tomatoes? Fifty years later, I’m raising a similar question. Does any of this have cash value? Imagine you’re with another human being trying to get them to behave in a certain way. You’re involved in a negotiation. You have an objective. You want something for your efforts. You want to present your case, influence the other, help him or her to get to “yes.” You have your toolbox. You can be eloquent, logical, manipulative, charming, or threatening in turns, depending on the situation. Maybe you want your boss to give you a raise. Maybe you’re trying to convince an enemy to surrender. Maybe you’re courting a loved one. This is all legitimate human activity. You want to do your best. Now imagine you’re putting on your bifocals. Now you see that your [boss, enemy, lover] is no different from yourself. Your [boss, enemy, lover] doesn’t exist independently. He or she is — like you — a part of the particular way the Dharmakaya, the Buddhistic universe, is expressing itself in this moment. This [boss, enemy, lover] is one of countless beings you’ve vowed to save. This [boss, enemy, lover] is a perfectly realized Buddha, here to save you. Bifocal perception changes the feel of the negotiation. You still want what you want, but now you’re as interested in the other person’s well being as your own. Your relationship has shifted, from I-It to I-Thou and beyond. The other is no longer simply your objective, but yourself as well. Bi-focality also helps us understand that nothing’s personal. Hurricanes, tornados, and disasters don’t happen to us. They just happen, and we just happen to be there at the time. It’s the same when others behave badly towards us. The other person’s behavior is the product of one-thousand-and-one antecedent causes and conditions — all of history conspiring to bring us together in just this way. From the perspective of the absolute, it has nothing to do with the other person or us. We’re like tectonic plates being shoved up against one other by powerful geological forces. If we can see this moment as the end product of the ongoing unfolding of the universe, we can take things less personally, be less egoistically involved in our misfortunes. This is not to deny our responsibility for our actions. The absolute and the relative are equally real. No one is left off the moral hook. But if we can loosen our egoistic involvement, our personal saga of victimization and righteousness, if we can wear our suffering like a loosely fitting garment instead of our core identity, new possibilities are free to emerge. Possibilities like forgiveness, negotiation and healing. “In light there is darkness, but don’t take it as darkness. Our practice and study are like trying to empty the ocean with a spoon, one spoonful at a time. It is certainly a stupid way of life, not a clever one. A clever person cannot be a bodhisattva.